I recently saw the question posed on the internet, "Can van Niekerk break the world record in the 200 meters?" To wit the response from most was a loud, "NO". That tends to be the response when talk of a long standing record arises. Longevity tends to breed the notion that a mark is invincible. I’ve seen enough records however, to know that eventually they all fall. Bob Beamon’s legendary 29′ 2.5" long jump elicited the phrase "Beamonesque" it was deemed so awesome and unbeatable – and it did last from 1968 until 1991. Then out of nowhere, in one meet, we had Carl Lewis (expected to break there record) at 29′ 1" LOSING to Mike Powell’s 29′ 4.5"! That’s how records go. The question isn’t will a record be broken, but what will it take to break the record. Because eventually, someone with the right skill set will come along and in the right moment, the right competition, a new standard is set. For example, speaking of the 200, it was once said of the previous record (19.32) that it would NEVER be broken – or at the very least, not in our lifetime. Nearly any one associated with the sport seemed to espouse that position. It seemed fairly simple to me however, that 19.32 was vulnerable! Why? Because Johnson was less about speed and more about speed endurance! Johnson had a 100 PR of 10.09, far slower than just about anyone else that had run sub 20 for the deuce. Similarly, as the event began to get "faster" in the mid 00s, it was sprinters between 10.00/ 9.90 doing the bulk of the damage – Carter (10.00/19.63) Spearmon (9.96/19.65) Dix (9.88/19.69). And previous 19.7’s Pietro Mennea (10.01/19.72) and Joe deLoach (10.03/19.75) were not sub 10 sprinters – Mennea’s record lasting from ‘79 to ‘96! Clearly, if the guys running the 100 got appreciably faster, AND gave a bit more focus to strength/endurance work, faster 200s were possible. Enter Bolt, seen early as a 400 prodigy, dropping down to the 100 – and dropping to 9.58. 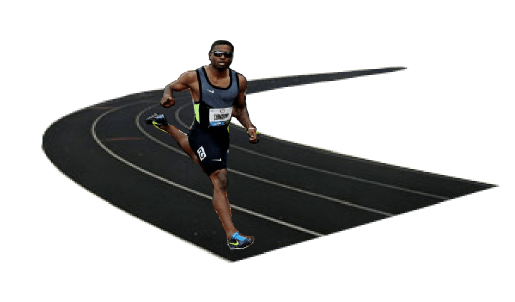 Tyson Gay improving his 400 to 44.86 and his 100 to 9.69 – 19.56 200 before injury and surgery. And Bolt training partner Yohan Blake going 9.69/19.26. It would seem that refocusing sprint training to incorporate more speed endurance, would yield much faster 200 times than focusing on sprint speed alone. Bringing us to the present and Wayde van Niekerk, who has a very unique set of marks to his credit – 9.93, 19.84, 30.81 and 43.03. Unique in that he’s the only sub 10, sub 20, and sub 44 athlete in history – and only Tyson Gay and Steve Williams join him as sub 10, sub 20 and sub 45. And also because he’s done all of the first three in the same season – and has gone 43.62 so far this year to go with those marks. Michael Johnson’s seasons seemed to focus around either the deuce or the quarter. Spending very little time in the 200 once he got the record in ‘96, as he spent ’97 thru ’99 pursuing the 400 record. As such, van Niekerk seems uniquely qualified to go after the 200 record. Faster in every other event than Michael Johnson who ran 19.32. Exceedingly faster/stronger in the 300/400 than current record holder Bolt and #2 Blake. Able to develop both is speed AND his speed endurance simultaneously! He “should” be able to bring enough of both to the table to give 19.19 a good run for its money. Of course records don’t typically happen "on demand", but rather based on the situation. Johnson stumbled out of the blocks, then ran like Hell to 19.32. Blake (19.26) was pushed all the way thru the race by Dix (19.53) in history’s best 1/2 finish. Tommie Smith’s 1968 record win in Mexico City was a come from behind afair as John Carlos had run a blazing 150. Bolt’s 19.19 was preceded by his 9.58 – a race in which he was pushed to the limit by Tyson Gay’s 9.71 in second. Bolt was at this peak for speed. Circumstances matter. And typically, so does the competition when it comes to the sprints. Take van Niekerk and his 400 record. Starting in lane nine, he had the pressure of two prior Olympic and World champions – and fellow sub 44s – to his inside. Running blindly he lead from start to finish. Resulting in his fantastic, easing at the tape, 43.03! So, what will it take to run faster than 19.19? I would think a hot race, which would require ample competition. Possibly two others in the race capable of 19.5x or better. That would require Blake back in form. Gatlin in form. Perhaps Merritt in form. Christian Coleman’s earlier races this year indicate that he could be in that category. As do previous runs by Andre de Grasse. Unfortunately, only deGrasse both currently fits the description and will also be running the event in London. So the likelihood of a record run in London, while not impossible, is likely improbable. More likely would be a race in 2018, an off year without a championship event – a season where athletes will have the freedom to race without trying to focus on a Major. The question then becomes, who will be ready to race at that level? It could give Blake more time to get back to form. Coleman will have an entire season as a professional. Trayvon Bromell should be fit again, and possibly better in the deuce. And deGrasse will have another season under his belt. These should be the contenders as Bolt will be gone and Gatlin likely gone if not simply aging. In either case, the man to beat should be van Niekerk. Who, in my humble opinion is capable of running faster than 19.19. Time will tell if I’m correct. This entry was posted on Sunday, July 9th, 2017 at 1:46 pm, by CHill. You can follow any responses to this entry through the RSS 2.0 feed. You can leave a response, or trackback from your own site.